Acipam (Escitalopram) is an orally administered Selective Serotonin Reuptake Inhibitor (SSRI). Escitalopram is the pure S-enantiomer of the recemic bicyclic phthalane derivative citalopram. Escitalopram is at least 100 fold more potent than the R-enantiomar with respect to inhibition of 5-HT reuptake and inhibition of 5-HT neuronal firing rate. Escitalopram has no or very low affinity for Serotonergic (5-HT1-7) or other receptors including alpha and beta-adrenergic, Dopamine (D1-5), Histamine (H1-3), Muscarinic (M1-5) and Benzodiazepine receptors. 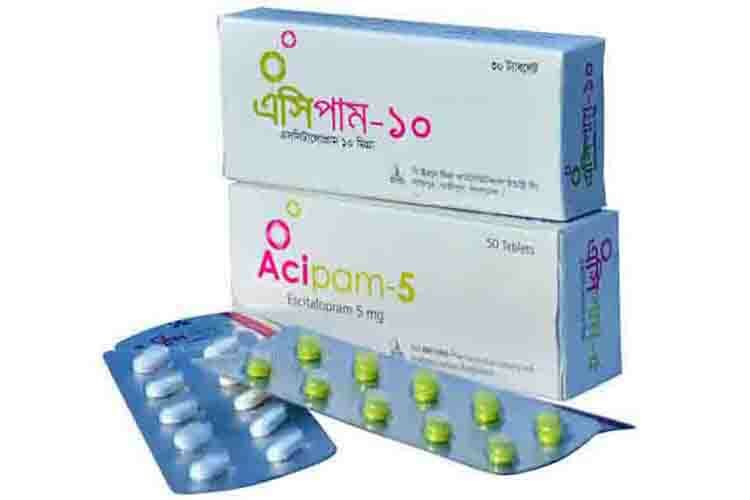 Acipam 5 Tablet : Each film-coated tablet contains Escitalopram 5 mg (as Escitalopram Oxalate INN). Acipam 10 Tablet : Each film-coated tablet contains Escitalopram 10 mg (as Escitalopram Oxalate INN). Acipam (Escitalopram) is indicated for the treatment of major depressive disorder and maintenance therapy to prevent people with depression from suffering a relapse. A major depressive episode implies a prominent and relatively persistent (nearly every day for at least 2 weeks) depressed or dysphoric mood that usually interferes with daily functioning, and includes at least five of the following nine symptoms: depressed mood, loss of interest in usual activities, significant change in weight and/or appetite, insomnia or hypersomnia, psychomotor retardation or agitation, increased fatigue, feelings of guilt or worthlessness, slowed thinking or impaired concentration, a suicide attempt or suicidal ideation. Major Depressive illness, Generalized anxiety disorder & Obsessive-compulsive disorder : Adolescent, Adult over 18 years: 10 mg once daily increased if necessary to max. 20 mg daily; elderly: initially half adult dose, lower maintenance dose may be sufficient; children: not recommended. Panic disorder : Adult over 18 years: initially 5 mg once daily increased to 10 mg daily after 7 days; max. 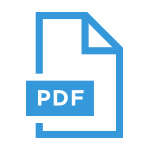 20 mg daily; elderly: initially half adult dose, lower maintenance dose may be sufficient. Social anxiety disorder : Adult over 18 years: initially 10 mg once daily adjusted after 2-4 weeks; usual dose 5-20 mg daily. SIDE EFFECT The following additional adverse reactions have been reported: agitation or restlessness, blurred vision, diarrhea, indigestion, nausea, increased or decreased appetite, increased sweating, sexual difficulties (decreased sexual ability or desire, ejaculatory delay), taste alterations, tremor (shaking), weight changes. The patient is taking monoamine oxidase inhibitor (MAOI), reversible MAOI (RIMA) and moclobemide Escitalopram should not be used. Pregnancy category C. The safety of Escitalopram during pregnancy and lactation has not been established. Therefore, Escitalopram should not be used during pregnancy, unless, in the opinion of the physician, the expected benefits to the patients markedly outweigh the possible hazards to the fetus. Escitalopram is excreted in human milk. Escitalopram should not be administered to nursing mothers unless, in the opinion of the treating physician, the expected benefits to the patient markedly outweigh the possible hazards to the child. Acipam should be stored between 15°C to 30° C.
Escitalopram should not be used if the patient enters a manic phase, hypersensitive to escitalopram and any excipients of the product. Acipam 5 Tablet: Each box contains 5x10’s tablet in blister pack. Acipam 10 Tablet: Each box contains 3x10’s tablet in blister pack.